You thought you were “over it.” Then you had kids of your own, and your childhood abuse was being re-lived through flashbacks and panic attacks. You have been afraid to tell anyone, because you are so scared of what might happen. But you are not alone, and there is help. to get the first chapter of Parenting with PTSD for free! Fall 2017 marks the release of a new parenting book determined to start a conversation that will change the lives of millions of parents. One-third of children experience childhood abuse, and yet the question is never asked: what happens when those children grow up and have families of their own? Editors Joyelle Brandt (of Port Moody, BC) and Dawn Daum (of Northville, NY) are survivors working to break the cycle for their own families. Raising children as an abuse survivor is often a lonely and isolating experience. When Joyelle read Dawn’s article Raising a Girl as a Survivor, she sought Dawn out to ask if they could create a book together. They discovered that they had both gone looking for a parenting book that dealt with these issues, and had not found what they were looking for. So together they started an online community specifically for parent survivors, and started collecting essays written by brave parents working to break the cycle of abuse. 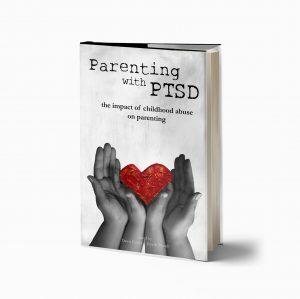 Parenting with PTSD is a collection of writing by 26 parents who are survivors of childhood abuse. Included in the anthology are essays written by fathers, a queer woman expecting her first child, mothers from inside and outside of North America, women of different ethnicities, single and married parents. What they have in common is a determination to give their children the safe and happy childhood they wish they’d had. Many survivors of childhood abuse are living with un-diagnosed PTSD that becomes un-manageable when they have kids of their own. And the worst part of that is the feeling that you are broken and alone. This book starts a conversation about what it takes for families to heal from generations of abuse. 1. To build a supportive community for parenting survivors, normalize the PTSD responses they may be having, and share resources for healing from adverse childhood experiences (ACEs) or other traumatic events. 2. To educate professionals working in the fields of physical, mental, and social health about common triggers that arise for parents with PTSD, and the challenges they experience while working to break cycles of generational dysfunction and abuse. 3. To help partners and families better understand the experience of parenting for abuse survivors.